Editors: Goldstein, Sam, Princiotta, Dana and Naglieri, Jack A. 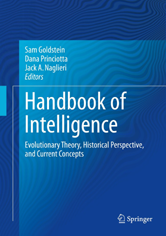 The Handbook of Intelligence addresses a broad range of issues relating to our cognitive and linguistic past. The Handbook of Intelligence is an essential resource for researchers, graduate students, clinicians, and professionals in developmental psychology; assessment, testing and evaluation; language philosophy; personality and social psychology; sociology; and developmental biology.